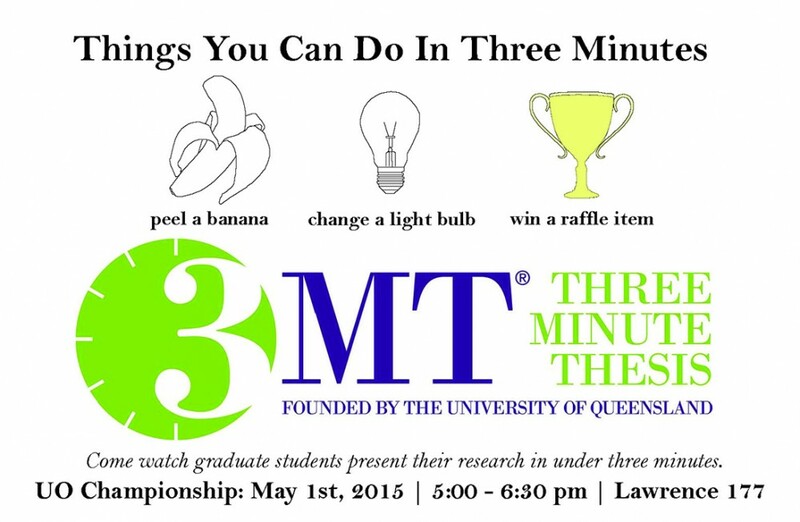 The competition, developed by the University of Queensland, Australia, is a challenge to graduate students to effectively explain their thesis research in three minutes or less. The preliminary rounds will be held from 5 p.m. to 6:30 p.m. in Room 177, Lawrence Hall on Friday, April 17, and the next week on Friday, April 24. The top five presenters from each preliminary round will advance to the UO Finals. The UO finals will be held on Friday, May 1, from 5 p.m. to 6:30 p.m. in the same location, with the top three presenters receiving awards and advancing to the statewide finals. The statewide finals will be held at Oregon Health and Science University on Saturday, May 16. The three UO students will compete against their peers from Oregon State, Portland State and Oregon Health and Science University. The only thing students may use to aid their presentation is a single static PowerPoint slide. No outside electronic media, props or sounds are allowed. Students will be judged on their communication style and ability to engage, and with the set time limit, efficiency is vital. The application deadline is Friday, April 3, at 5 p.m. Registration is available here: http://gradschool.uoregon.edu/3MTapplication.